Last week, I wrote about a box I sent away. I was worried about its journey to Pittsburgh. So many of you wrote, asking if the box made it to the destination. I am glad to tell you all that it arrived in one piece! You see, I had made a shawl for my mothers first cousin, Ruth. I have not seen Ruth in so very long and wanted to send a hug of sorts to her. knowing that I would send it to Ruth after it was finished. This past Friday evening, I received an email from Kathy, Ruth’s daughter. With the email, was a photo. 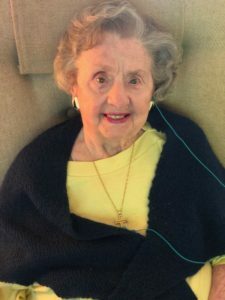 It was a photo of beautiful Ruth with the shawl on. She looked gorgeous. and Larry and I hope to see you soon. Consider the shawl a hug from us. Much love to you and Kathy. Family is the best. Love you. I am not sure how often I will be posting this week, because…..
but our schedule is crazy and Matilda is going to keep me busy! 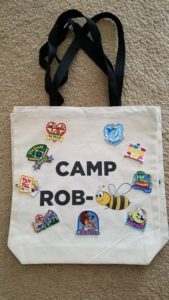 I designed our new 2018 bags….with patches added! Stay tuned for Camp Robi updates! This is going to be the best week! Love you beyond yarn from Paris….